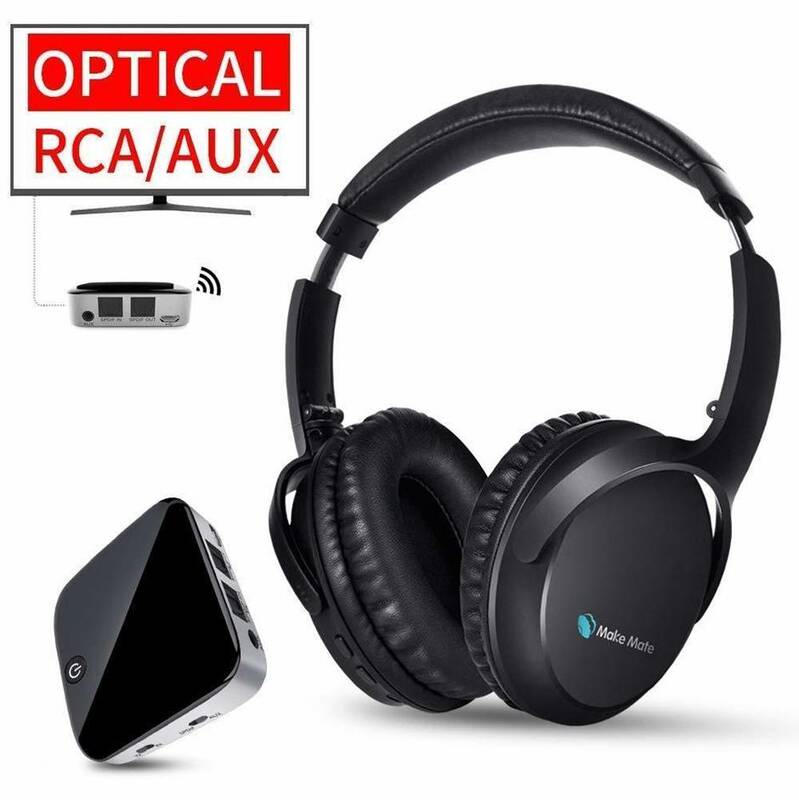 In this review we feature the best wireless headphones for TV that are designed to connect to any TV via RCA, auxiliary or optical inputs and transmit music directly to your wireless headphones. 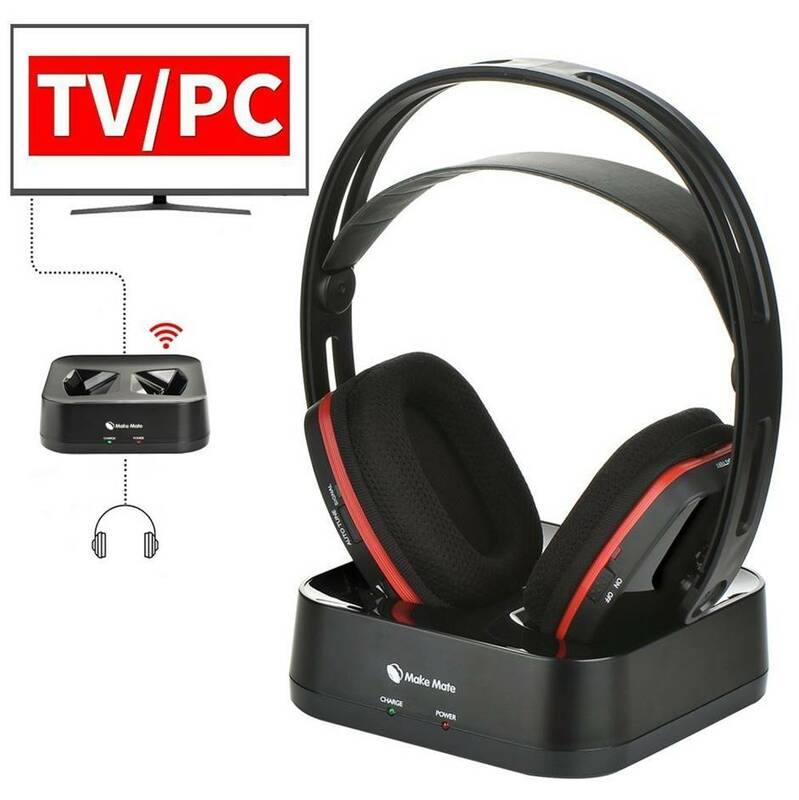 These wireless headphones come in a set together with a transmitter dock – the transmitter dock acts as the interface between your TV and the wireless headphones. Our experts have tested over a hundred different models to determine which wireless TV headphones deliver the best sound quality and performance. If you are looking for a quick solution to connect your TV to wireless headphones, be sure to check out our top picks below! The ARTISTE ADH300 are a pair of high quality wireless headphones which have been designed for optimum usage when used with a computer or television. They connect wirelessly through high frequency radio waves which perform exceptionally well. They have a transmission range of 30 metres, no signal loss or delays and no audible distortion or interference. The headphones connect wirelessly to a base station, which in turn connects to the audio source through a RCA or TRS connector. The ADH300 produces high sound quality due to its high quality components and design, rendering sound with deep bass, balanced mids and crispy high end. Its frequency response ranges from 25Hz in the lower range to 20kHz in the high register. We liked the fact that the ADH300 headphones are comfortable to wear because of their ergonomic design, adjustable soft-padded headband and circumaural ear-cups. The closed back design ensures no sound spilling, making those headphones ideal to be used in quite environments without disturbing other people. The battery lifetime provides an impressive 20 hours of continuous audio playback, enabling users to have long listening session without having to interrupt their activities in order to charge the headphones. 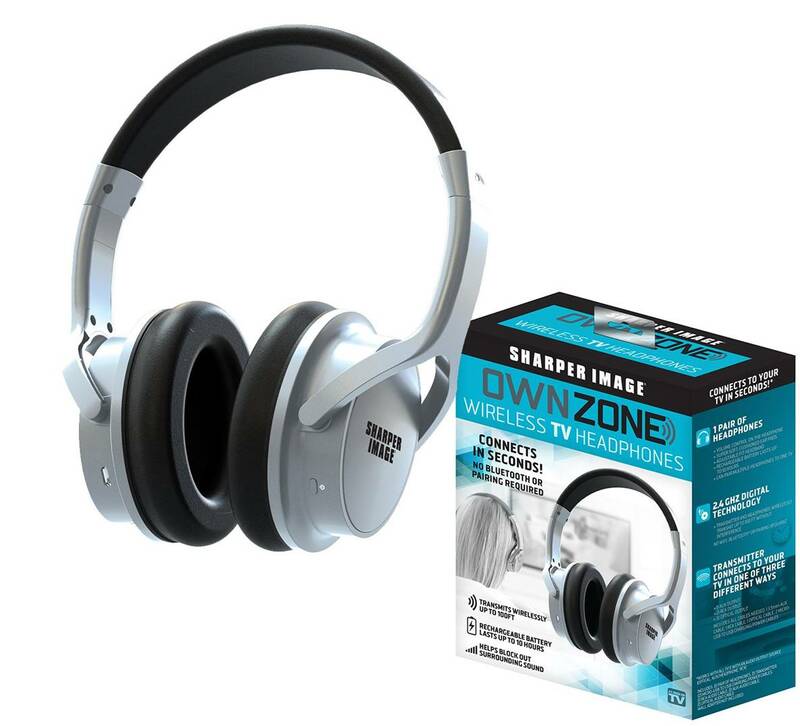 The Sharper Image Own Zone headphones provide high quality wireless audio suitable for consuming audio-visual media. They provide high quality wireless transmission through high frequency radio waves up to a range of 30 metres. The audio signal suffers no signal loss or latency during the transmission process, meaning that the video and audio of your television are always going to be synchronised. 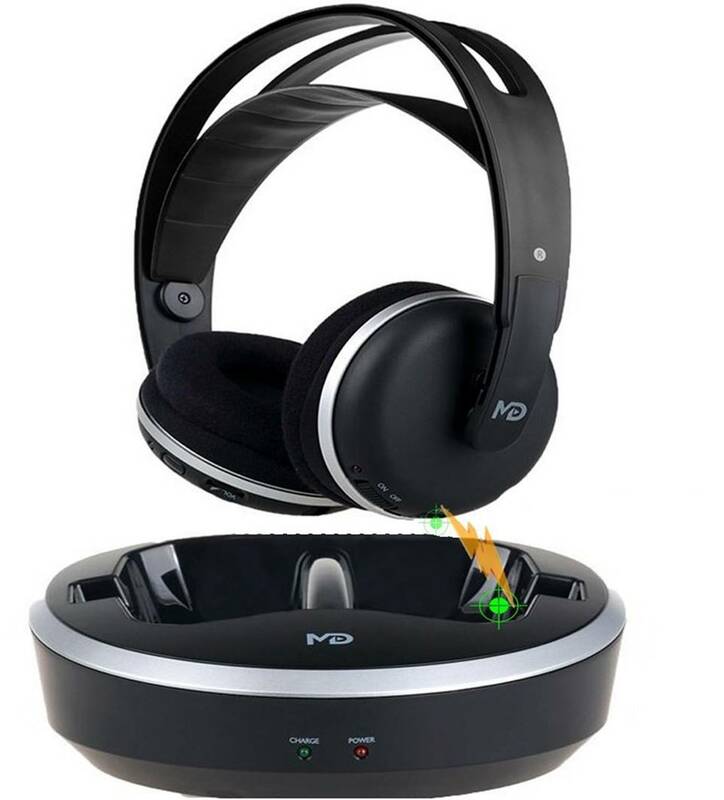 The Sharper Image headphones connect to a base station which in turn connects to the television. It has a multitude of connectivity options such as a AUX through a 3.5mm TRS, RCA or digital optical cable. The headphones charge through the base station and can provide up to 10 hours of continuous audio playback from a full charge. The Own Zone have a closed back design, meaning that there is no audio spilling from the headphones, which make them ideal to be used in quite locations. Overall, these headphones deliver high quality audio with a balanced frequency response which works very well with video. The headphones are comfortable due to their ergonomic design, padded earcups and adjustable headbands, making them fit on people of all shapes and sizes. The Ansten wireless headphone system provides high quality audio and a comfortable listening experience. They have been optimized for television and computer usage. 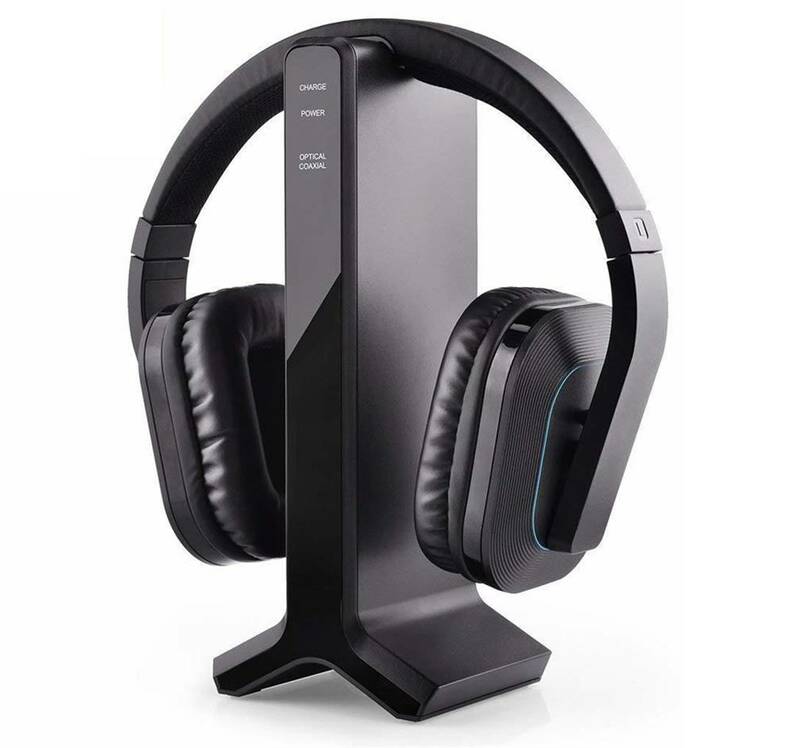 These headphones render good audio quality with a balanced frequency response which works very well for audio-visual media such as movies or video games. 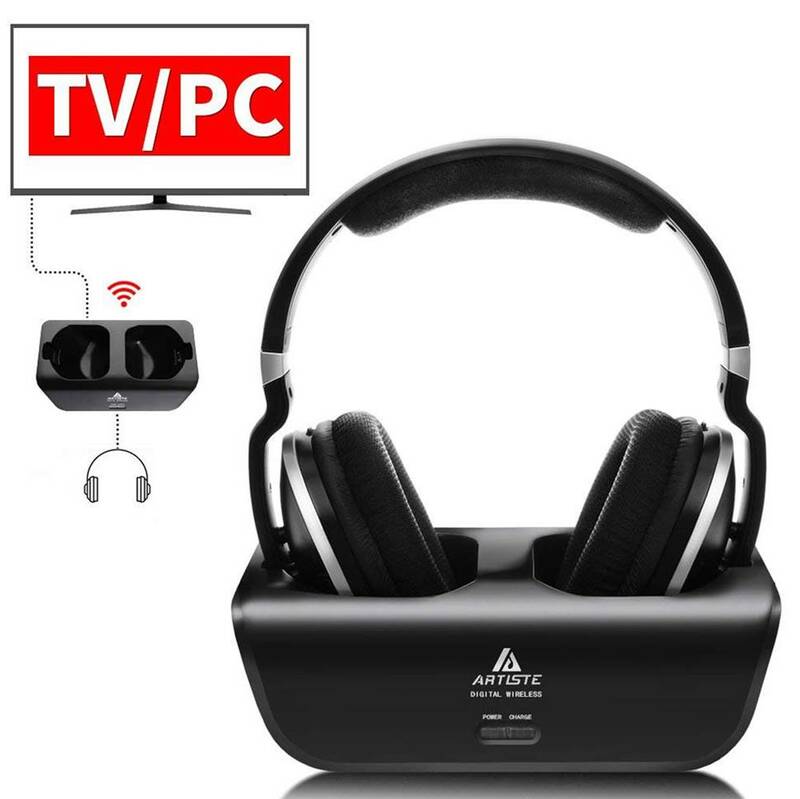 The Asten wireless headphones for TV connect wirelessly to the charging station through high frequency radio waves, maintaining a reliable connection which has a range of up to 50 metres and can pass through various barriers such as walls and doors. This transmission medium poses no signal loss or delays issues, resulting in a consistent audio-visual experience with perfect synchronization with the TV screen. The charging station connects to the sound source using RCA or TRS connectors. The headphones charge when placed in the transmitter without having to connect any cables. We liked the fact that the battery has a long lasting lifetime, delivering up to 25 hours of continuous audio playback. Users will not have to interrupt their viewing experiences to charge their headphones. The Anstent’s ergonomic design ensures a comfortable listening experience. They have soft-padded earcups and an adjustable headband, making them suitable for any kind of user. 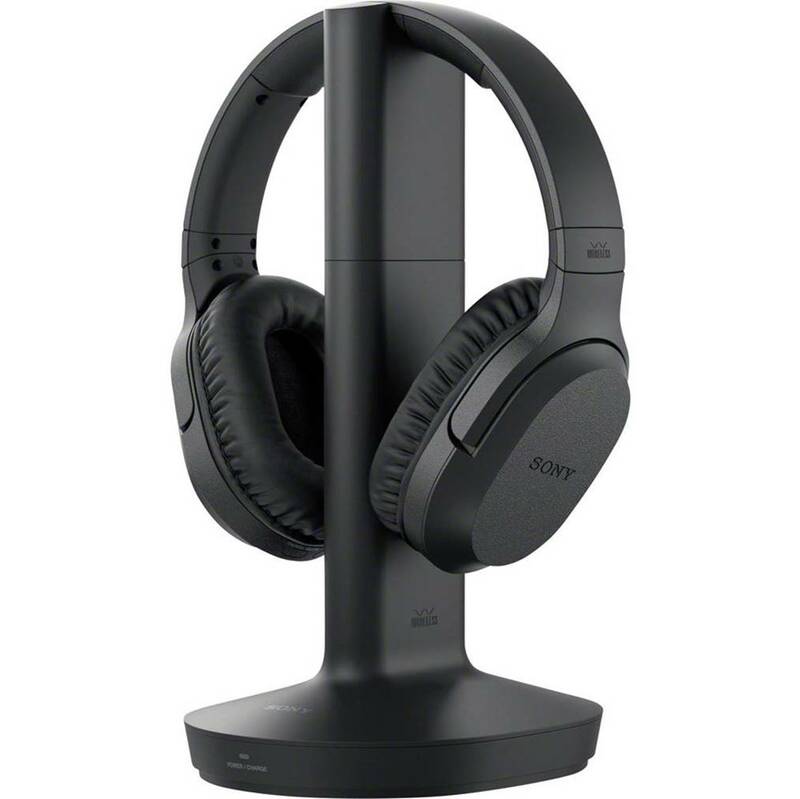 The Sony RF995RK are a pair of well-designed wireless headphones which have been optimized for watching television. They deliver high quality audio by connecting wirelessly to the base transmitter using radio frequencies, enabling users to move freely up to a distance of 50 metres without suffering from delays or signal loss. They render high fidelity audio which is characterized by a deep bass, balanced mids and highs. Do note that your TV needs to have either left or right RCA output jacks to connect to the headphone transmitter, or via the 3.5mm auxiliary input for the transmitter to stream music to the Sony headphones. The Sony RF995RK wireless TV headphones are equipped with powerful 40mm drivers which render lean, warm, detailed sound which works well in all scenarios, either for listening to music or producing crisp and detailed dialogue in a movie. They have a Voice Mode feature which enhances the frequencies which make human speech stand out from the background sounds. They charge by being placed on the base transmitter without requiring any cables plugging in. The battery life on these headphones lasts an impressive amount of time, delivering up to 20 hours of continuous audio playback. Because of this, users do not have to interrupt their listening sessions to charge their headphones. The RF99RK have an ergonomic design enhanced by comfortable earpads and adjustable headband. The Avantree HT280 deliver high quality audio through a reliable wireless transmission medium, being suitable for TV and PC usage. They are easy to set up without any kind of pairing required. The headphones connect automatically to the transmitter, which in turn connect to the audio source using a RCA, TRS or optical connectors. The transmitter also fulfils the function of a charging dock, the headphones recharging when placed on top of the transmitter. The Avantree HT280 comes with a built-in battery battery that provides 12 hours of continuous audio playback on a single charge. The distinguishing feature of the HT280 is the sound isolation ability which minimizes the sound spill while also providing louder than average sound playback. This feature has required a small compromise on audio quality, sacrificing the details and spaciousness elements for the sound insulation and volume output. However, the HT280 are still an excellent choice for amateurs who enjoy watching movies or listening to music. We liked the fact that the HT280 headphones feature 2.4 GHz wireless technology which allows you to watch TV shows and movies in perfect synchronization without any delay. These headphones have an ergonomic design and provide a comfortable experience alongside the padded earcups and adjustable headband. The Monodeal wireless headphones deliver high quality audio and a comfortable listening experience for enjoying video, movies and video games. They use a low-latency radio frequency transmission technology which ensures permanent synchronisation between audio and video. There are no signal loss issues or audio quality degradation at up to 160 metres using this transmission technology. Using large, 40mm drivers, the Monodeal headphones render high quality audio which bring out details and emphasize voice quality. They are equipped with a built-in bass booster which can create an impact when watching movies and playing video games. The base station works both as a wireless transmitter and a charging station. The base station connects to an audio source through a wired connection. We liked the fact that the wireless transmitter features three RF signal channels which enables interference-free reception for stereo sound through walls and ceilings up to 164 feet away – this means that you can listen to music and walk around your home without any interference. The expanded reception range also allows the headphones to be used when not in sight of the transmitter. To charge the headphones, they need to be placed on the transmitter. The battery lifetime is impressive, providing up to 25 hours of continuous audio playback. The headphones are comfortable due to their ergonomic design, soft headband and padded earcups. You can hear these headphones for hours on end watching TV without feeling ear fatigue due to its ergonomic and relatively lightweight design. The Jelly Comb wireless TV headphones deliver high quality audio without sacrificing on convenience and comfort, enabling users to enhance their movie and video games experience through audio immersion. They are compatible with most TVs and audio systems as the base transmitter connects using a 3.5mm TRS or RCA connector. The transmitter communicates with the headphones using radio frequencies which are able of carrying through high quality audio without any delay or transmission signal loss. The Jelly Comb headphones have a range of up to 20 metres indoors and up to 100 metres outdoors in an open field. Users can choose between 3 different frequency bands in order to avoid interference with other radio signals. The transmitter also functions as a charging station, recharging the headphones without the need of a cable. 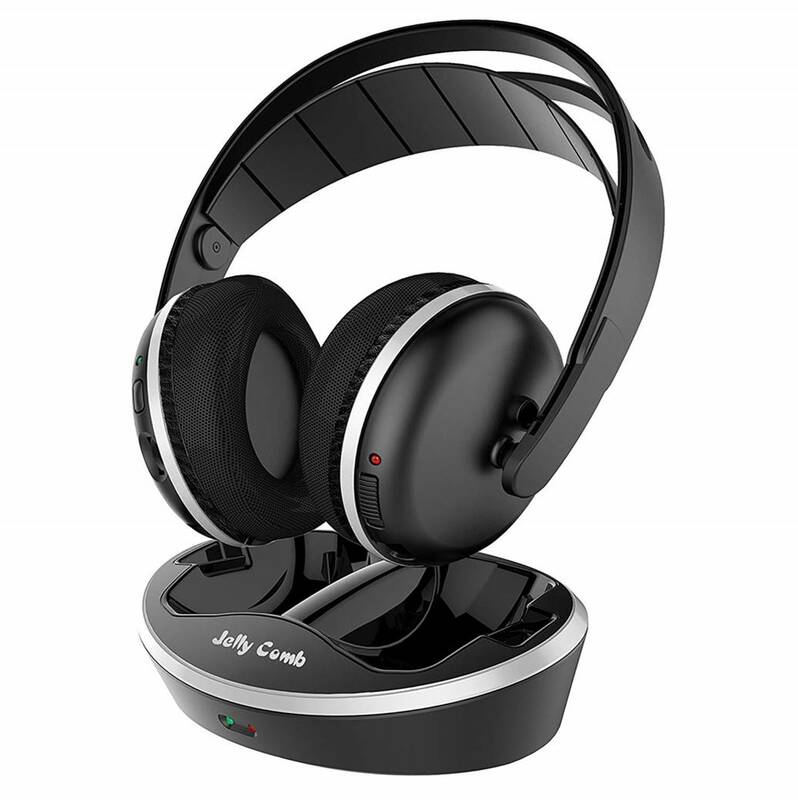 In terms of sound performance, the Jelly Comb headphones deliver great sound quality, having a balanced frequency response across the whole spectrum, making them ideal to enjoy television and computer games at a high audio quality. The headphones are lightweight, padded and adjustable, making them very comfortable to wear. They enable users to have long listening sessions without causing any kind of discomfort. 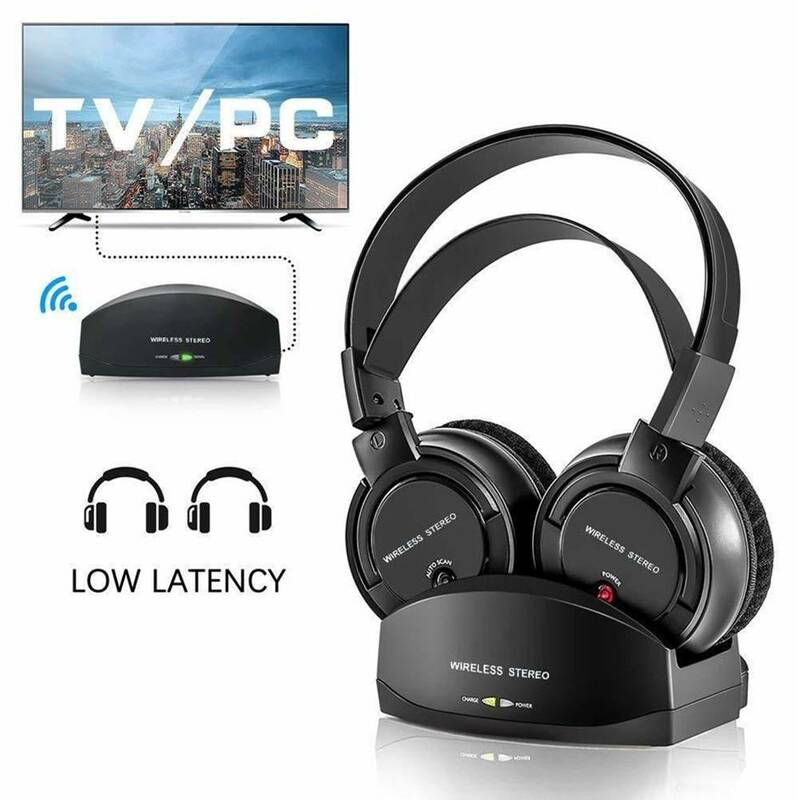 Furthermore, these headphones support wireless RF signal from the transmitter dock and has a long range of up to 328 feet unobstructed or 66 feet inside the house – this allows you to walk around your home and still enjoy listening to TV shows and music without any interruption. Finally, the Jelly Comb TV headphones are very comfortable to wear with a lightweight over-ear design and adjustable headband, which reduces ear fatigue after prolonged periods of listening. The ear cans are padded with sweat dryer technology memory foam which rests softly over the ears. The Make Mate BKM100 wireless headphones have been designed to deliver a great listening experience for users who are watching television or playing video games. The headphones communicate with the transceiver using Bluetooth technology, which streams audio directly from the TV. The communication medium poses no transmission issues such as signal loss, degradation or delay, enabling a high quality and consistent audio experience. The video and audio are perfectly synchronised regardless of the distance or movement of the user. The BKM100 headphones come with 40mm drivers which ensure that the headphones deliver high quality audio, with a clear and focused rendition of human speech, which makes it distinguishable from other sounds in movies and videos. It also has a maximum SPL of 110dB and can produce a tonne of volume without any distortion. They produce good sound across the frequency spectrum having a deep and powerful bass, clear mids and crisp highs. The BKM100 have an ergonomic design which ensures a comfortable experience, alongside the padded earcups and adjustable headband. We liked the fact that the BKM100 headphones come with soft protein earpads and an adjustable headband which naturally adjusts to your head size. The headphones can be worn for long periods of time without creating any discomfort. The Bluetooth headphone transmitter connects to the audio source using both analogue and digital connections, making the BKM100 compatible with most devices such as TV sets, computers, tablets, smartphones and laptops. The BKM100 headphones also support wired and wireless streaming modes, and come with a built-in 300mAh rechargeable battery that provides up to 15 hours of playtime on a single charge in wireless modes. 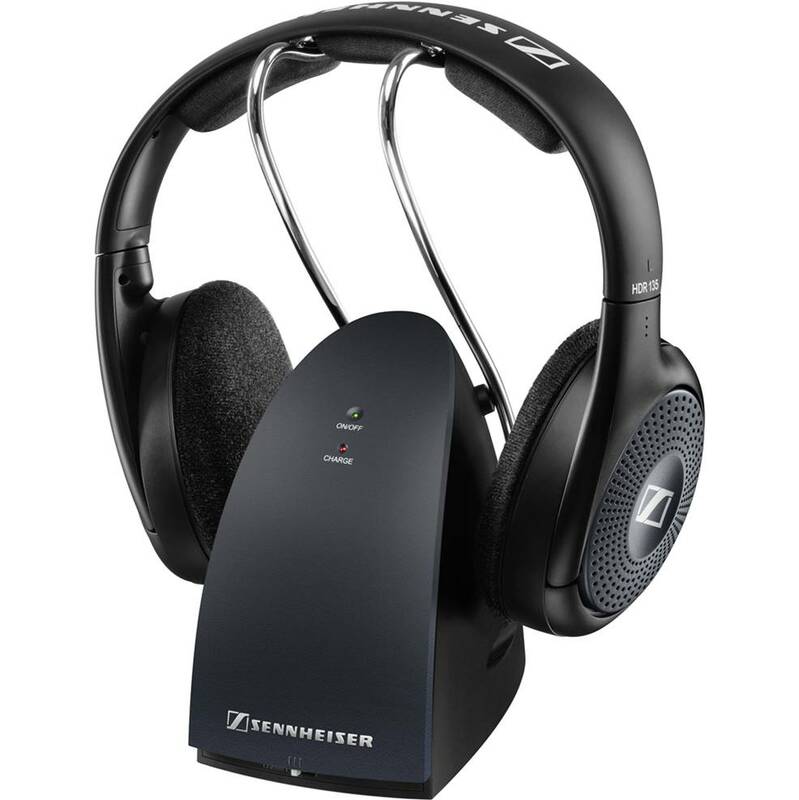 The Sennheiser 506298 RS 135 are a pair of high quality wireless headphones which provide a great audio experience. They have been designed to deliver the best sound for audio-visual media such as videos and video games. The headphones communicate with a base transmitter through radio frequencies, the transmitter communicating in turn to the audio source using analogue RCA connectors from your TV. The 506298 RS 135 headphones for TV render high quality, transparent sound, featuring a responsive and powerful low-end. The bass response on these headphones hits tight and punchy, and adds a layer of intensity while watching movies and TV shows. They have an open-back design which offers a sense of spaciousness to the audio, allowing an easy placement of sounds within the stereo space. However, this features compromises on sound insulation, the headphones having a fair amount of audio spill which is unsuitable for public spaces. The ergonomic design alongside the adjustable and padded earcups and headband ensure a comfortable experience that enable users to wear the headphones for long periods of time without suffering from any kind of inconvenience. The headphones are charged by simply being placed on the transmitter, without requiring any cable plugged in. Overall, these headphones are suitable for all types of modern music and TV applications and designed for listening convenience. The Make Mate RCH-900 are a pair of well designed, comfortable headphones which have been optimized to provide a great audio experience for watching tv, movies or playing video games. The headphones communicate with the transmitter using radio frequencies, which are able of delivering high quality audio with minimal latency and no signal loss. They have a communication range of up to 30 metres in which there is no signal degradation. Users have the option of choosing between 3 frequency bands in order to avoid interference with other radio signals. The base transmitter connects to the audio source using analogue RCA or 3.5mm TRS cables which are compatible with most existing devices and audio systems. The headphones charge just by being placed in the base station without the need of a cable. The RCH-900 delivers high quality audio and features a closed back design which minimizes spill and increases audio clarity. They are suitable to be use in both noise and quite environments as they block outside noises and cannot be heard by outsiders. The headphones deliver a comfortable listening experience as they feature padded earcups and an elastic adjustable headband, ensuring that the headphones fit on people of all shapes and sizes. The wireless headphone transmitter is compatible with TVs that have analog, RCA, and 3.5mm auxiliary outputs. Do note that the RF transmitter on these headphones will automatically switch off if no audio signal is detected after 10 minutes to conserve energy.